The band have a pace, energy and an infectious quality that I think would blow a crowd away. Sweden's still very much known as the one-stop shop for Rock but it does mean there's more dirt to dig through to find the gold. 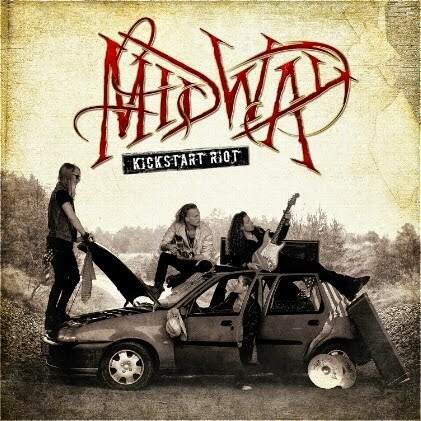 Midway have flashes of gold; take their quirky rhythms, unpredictable song-writing and general standard of playing. They are, however, only fleeting flashes. I don't usually like intros but if they were all like this one I could get used to them. There's a bit too much of the Sci-Fi style creeping in and I prefer the guitar to the electronic sound effects but it could be far worse. Proper opener 'When I Was With You' combines punchy Hard Rock with almost Rap-like vocals. Listen carefully and you'll hear touches of AOR between chorus and verse. Vocalist Leaf isn't strong in the higher register but it's good to hear a bassist really playing around with rhythms and riffs in the background; it adds a Funky flavour to the album. There's not always much holding the songs together, as if the band is just jamming in introductions or bridges. A big flash of gold arrives in the middle of the album in the shape of 'Come On Take Me'; backing vocals that sounded weak on other tracks suit the loose, wild mood of this song. 'Hey Ho' is charged with a relentless punching guitar and vocals curled into screams. Ballad 'She's Gone' is laced with some of the most powerful melodies on the whole album but the performance is less than perfect and a little rambling. 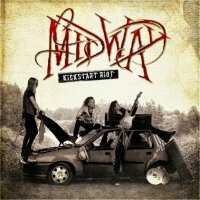 Midway does the whole hard-hitting riff well but it often feels like the songs run away from them and they lose control, as if they're trying to do much in one track. With this band, less could be more, especially when it comes to long solos. It's almost like guitarist Sam Cobra can't keep his hands still in the introduction to 'Cocaine' where he relentlessly wanders up and down the fret-board and it happens again during the verse. The chorus fails to pack a punch with more weak vocal melodies. I almost feel like Midway would suit the stage more than the studio. The album is messy, rough and not always interesting, but the band have a pace, energy and an infectious quality that I think would blow a crowd away.